Much consideration has been given to the state of the career of Jonathan Toews, long-time captain of the Chicago Blackhawks. Now in his 12th NHL season, Toews has seen an incredible amount of success. He’s set the bar high, which is why he, and many in the hockey world, are critical of his last three years in the league. Set against his standards, Toews’ 2015-2018 seasons were mediocre at best. But his history is still being written, and Toews is off to a fine start in this 2018-19 campaign. So what can we currently infer about the state of his career? This is where one needs to take a step back and look at the big picture. I mentioned “his standards”. Because Toews has never been normal. In fact, he’s always been quite extraordinary. To understand what I mean, we must start at the beginning. Toews was born on April 29, 1988 in the St. Boniface-Winnipeg area to Bryan Toews and Andree Gilbert, and seemed destined for the NHL at a very young age. His dad tied on his first pair of skates when he was only three and says he became an instant whiz on ice. And win he did. When he was still a pup, the elder Toews built a backyard rink for Jonathan and his kid brother David so they could skate till they dropped. What others called hard work was fun for the Toews family. Dad skated right along with the boys as their skills grew and their talent developed. The payoff came quickly. 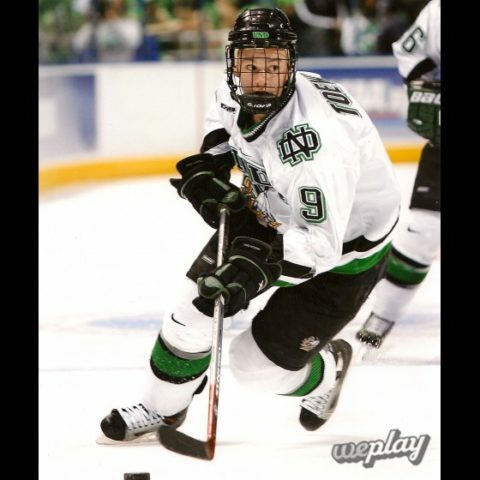 In his Bantam year Jonathan was drafted #1 by the Tri-City Americans but chose instead to play high school. In his last high school year he played at Shattuck-St. Mary’s in Faribault, MN (110 points in 64 games) and ended up spending the next two years at the University of North Dakota where he amassed 85 points in 76 games, had a plus-38 rating and led the Fighting Sioux to the Frozen Four in both 2006 and 2007. Drafted third overall by the Chicago Blackhawks in the 2006 Entry Draft, Toews made the leap to the NHL in the fall of 2007 at age 18. Along with Duncan Keith and Patrick Kane, Toews was part of a new-blood youth movement that moved the 2008 Hawks into the playoffs for the first time since 2002. In December of his second year (2008-09) he was made an assistant captain and on July 18, 2009 was named captain at the ripe old age of 20, becoming the third youngest player to do so behind Vinnie Lecavalier and Sid Crosby. His nifty scoring touch and his heads-up style of play have made him a fan favorite. He was rewarded in December 2009 with a six-year contract extension worth about $6.5 million a year. Toews competed internationally for Team Canada and won gold medals at the 2005 World U-17 Hockey Challenge (leading scorer 8-4-12), 2006 and 2007 World Junior Championships and at the 2007 Men’s World Championships. In the semi-final against the USA, he scored once in regulation and three times in the shootout to advance his team to the finals. The year 2010 was kind to this powerful young player. In February, he competed for Canada against the World in the 2010 Winter Olympics in Vancouver, leading his team with eight points. His seven assists led the tournament while he tallied his only goal to open the scoring in the crucial Gold Medal game against the USA. At the end of the two weeks, sporting a shiny new Gold Medal, Jonathan was named Best Forward. Back in Vancouver in May for the NHL Western Conference semi-finals, in the pivotal fourth game, with three goals and two assists, he tied Stan Mikita’s longstanding Blackhawks record for most points (5) in a single game. But it didn’t end there. Toews and his Blackhawks went on to win the Stanley Cup that year. 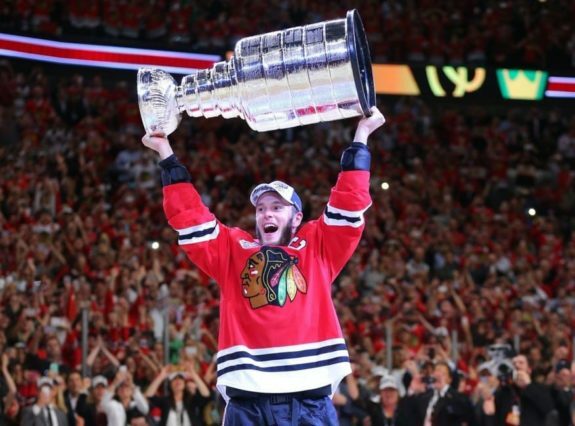 It was the first time Chicago hoisted the Cup since 1961, a drought of 49 years. Toews was awarded the Conn Smythe Trophy for the most valuable player in the playoffs. He amassed seven goals and 22 assists in 22 playoff games. He also became one of only eight players to win Olympic gold and the Stanley Cup in the same year. This intense and driven young man charged on. He led his team to two more Stanley Cup championships, in 2013 and 2015. He was awarded the Selke Trophy for best defensive forward in 2013. In 2015, Toews received the Mark Messier Leadership award for being a leader in his sport as well as a contributing member of society. He was also recognized as the ESPY Best NHL player, selected by an ESPN Nominating Committee. Between 2009 and 2017, he participated in four NHL All-Star games, and was nominated for six. In 2017, he was part of a prestigious group that was honored as the 100 Greatest NHL Players. Internationally, Jonathan Toews again represented and won the Gold Medal with Team Canada in the 2014 Winter Olympics. In 2016, he was a part of the Canadian team to win gold in the World Cup of Hockey. Success comes with it’s perks. 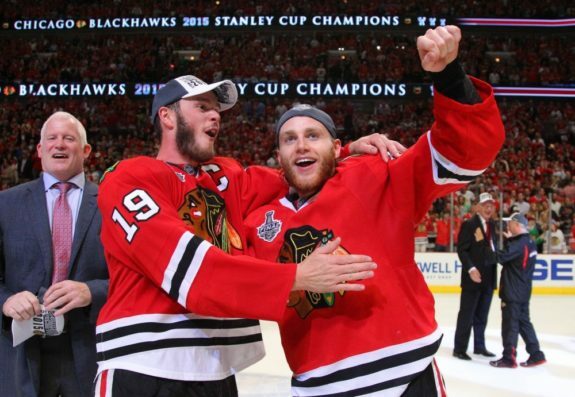 In July of 2014, the Blackhawks signed Toews and teammate Patrick Kane to identical eight-year contract extensions to the tune of $10.5 million per year. The contracts went into effect for the start of the 2015-16 season. Having two players eat up $21 million dollars in cap space is not exactly ideal, but the Blackhawks felt it was worth it for these two “faces of the franchise” that essentially turned the fortunes of the team. Especially for Toews, it’s been a double-edged sword. His history earned him a sweet contract, but there is also the constant pressure to live up to it. I already mentioned Toews’ supposed lack of production over the last three years. Until then, he was considered one of the best two-way players in the league. After all, it’s his job to take on the responsibilities of playing center and taking faceoffs. He’s tasked with shutting down the opponent’s top lines, in addition to producing offensively. Yet, he’s constantly compared to his teammate, Kane — but Kane is more of a one-dimensional player. He’s really only taxed with the offensive side of things. Comparing them isn’t exactly fair. 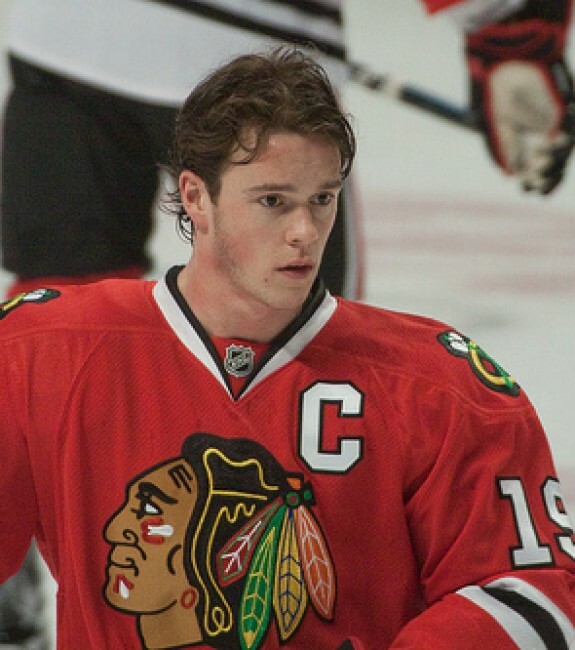 The truth is that the Blackhawks’ system expects much more of Toews than it does of Kane. If Toews was only tasked with the offensive side of things, would he be as good as Kane? Hmm, probably not, but you get the point. While everyone wants Toews to score as many goals as Kane, that’s not the way it works. Let’s look more closely at Toews’ production. Last season, he logged 52 points. The two regular seasons before that, he recorded 58 points each year. His average points before that, from 2008 to 2015, was 63 points. From that standpoint, it’s been quite a dip in production. But he’s arguably been given more defensive responsibility over the last few years. He’s lost long-time linemate Marian Hossa (who was no slouch defensively himself), and seen a revolving door of linemates on his left wing. All in all, he’s simply been given more responsibility coupled against not as much to work with to create offensively. Which brings us back to the present and the future. To start the 2018-19 season, Toews looked like a different man with the benefit of some new linemates. Alex DeBrincat is in his second year with the Hawks. The left winger led the team in goals in his rookie season. 23-year-old German forward Dominik Kahun uses his speed and skill to complement this dynamic first line. With this support, Toews got off to the best start in his 12-year career with five goals and one assist in the first three games. He cooled off a bit after that, recording three goals and four assists in the next 12 games. But his eight goals and five assists (13 points) still ranked him third on the team in points through 15 games. He also recently notched his 300th NHL goal. All signs point towards a resurgent year for the 30-year-old center. Lots of things have changed over the years. The game has gotten faster. Linemates have come and gone. Toews has gotten older. But the best players are supposed to fight through all those things, right? Toews looks to be doing just that. He’s the beloved captain of the Blackhawks, and he’s still one of the faces of the franchise. At this point, things could go either way. He could slowly decline, and just have memories of the glory days. Or he could have a resurgence, and potentially lead his team to another Stanley Cup. There are so many factors involved. Only time will tell. Regardless of the outcome, I think it’s safe to say Jonathan Toews has already earned the right to be considered one of the all-time great hockey players, and a future Hall-of-Famer.